Sorry, We Are Full: We are not taking on work for new customers so we can focus on our existing customers. 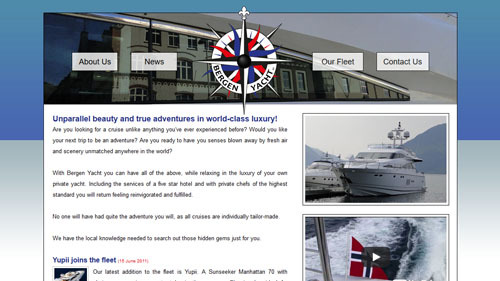 Bergen Yacht came to us with the brief to design and develop a crisp and captivating website to promote luxury yacht charters on Norway's beautiful fjords. Initial research for the trip included a trip aboard one of their luxury yachts for several nights. As well as taking photos and video that were used on the website the trip also allowed an article about the charter to be written. This article was featured on Yacht Charter Guide. A core part of the design work was to develop a striking corporate identity from scratch. Several designs with a contemporary Norwegian feel were presented including a shield crest. The design that was agreed upon and further refined in Adobe Illustrator as a vector format so that it could be used in offline as well as online marketing was the compass design which can be seen below. As you would expect the site's homepage had several striking images of the charter yachts in the beautiful fjords that were taken on the trip, as well as a very short video taken as we powered through the water. In addition the homepage allowed speedy access to a booking calendar so that customers could see which yachts were available to charter for their preferred dates. It was also suggested that Bergen Yacht make use of the sophisticated itinerary builder so that the company and their customers could create interactive itineraries using the host of waypoints (villages, restaurants, waterfalls) in the region.